Many investors believe that one can only beat the market by investing in the market’s hottest growth stocks. However, I’m here to tell you something different. You CAN and WILL beat the market by investing in the market’s best dividend stocks that will not only bring your portfolio double and triple-digit winners, but also provide a decent dividend to increase your overall returns. Here’s how I can prove it. Our contributors recognize the top-performing industries and sectors, giving our readers not only the highest-yielding investments in this low interest rate environment but also stock picks that outperformed the market. The key to success we use in Wall Street’s Best Dividend Stocks is targeted “stock-picking.” That means relying on the folks who have seen many market ups and downs—those investment professionals who have not only survived but prospered with their excellent skills and expertise through years of up and down markets. Wall Street’s Best Dividend Stocks contributors not only beat the market year over year – they trounce it too! Start profiting from Wall Street's top dividend investments and start increasing your returns by grabbing our next double and triple-digit winners. You too can start profiting from the market’s top income investment recommendations from the top analysts on Wall Street, delivered right to your email inbox every day. You can have direct access to the very best dividend-paying investments, the cream of the crop, from the brightest folks in the business. Not just four or five analysts, or even a dozen—over 200 expert analysts in all! These are the very best recommendations from the very best minds on Wall Street. Like George Putnam of The Turnaround Letter, John Buckingham of Prudent Speculator, Roger S. Conrad of Utility Forecaster, and many, many more. These experts are pros at identifying and analyzing income investment opportunities. And you can have access to all of them in one place—your email inbox! You can have those for a fraction of the cost. My name is Nancy Zambell and I am the chief editor of Wall Street’s Best Dividend Stocks. Every month, my team and I scour over 200 of the top investment advisories, looking for income-producing investments that have the greatest potential. We send you a well-researched, high-potential recommendation every weekday, before the market opens. Then, once a month, we’ll send you a concise, 12-page digest, which includes the Daily Alerts from the past 30 days (just in case you might have missed any), plus market analysis, follow-ups on previous picks and an in-depth report on our monthly Spotlight Stock. These are the very best opportunities for you to add income-producing investments to your portfolio. And they come from the best and the brightest that Wall Street has to offer. Why Choose Investments that Pay Dividends? In today’s market of advanced technology, high-frequency trading and hedge funds, stalwart dividend investments sometimes get overlooked. But there are plenty of good reasons to choose income-producing investments for your portfolio. With dividend-paying investments, you have the flexibility to re-invest your dividends or take them in cash. Reinvesting means you’ll power up your portfolio by using both appreciation and compounding. Taking dividends in cash means you’ll have extra money to spend. The choice is yours. Here at Wall Street’s Best Dividend Stocks, we review all the top dividend investments, as recommended by leading advisors. We apply our own criteria, and weed out those investments that may be favored by one advisor and panned by another. We bring you only the ones that show the most promise, and give you the best opportunities to boost your portfolio and secure your financial future. And these are not your grandfather’s stocks and bonds. Wall Street’s Best Dividend Stocks includes recommendations for some of the most exciting opportunities available to individual investors. We feature real estate investment trusts, master limited partnerships, business development companies, equity-linked securities and more. “This publication and all of the advice offered in the other Cabot publications to which I subscribe, along with updates, have helped to make me a substantial amount of money. Thanks again!” –P. Saltman, South Hadley, Massachusetts, U.S.A.
“I buy on the advice and have done quite well.” –James M. Strucc, Pittsburgh, Pennsylvania, U.S.A.
“It’s quite valuable … gives me a better perspective on the market.” –J. Keiser, Silver Spring, Maryland, U.S.A. If you were to get a subscription to all the individual publications of our Wall Street contributors, it would cost you more than $10,000. However, you can join Wall Street’s Bests Dividend Stocks for just 40 cents a day for an annual subscription! It’s the best scenario for everyone. You get a chance to sample the picks from the top minds on Wall Street at the lowest price while they get a chance to share their picks with you. 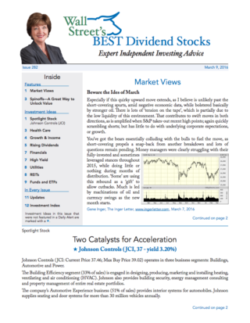 • 30+ top dividend stocks handpicked by me, including a 12-page tightly written editorial, which includes her economic overview and consensus picks delivered to you every month. • One top new recommendation culled from the hundreds that advisors send us delivered to you every day. • Updated buy, sell or hold recommendations. In other words, we track these recommendations for you through the pages of Wall Street’s Best Dividend Stocks and daily investment alerts. • My market-beating take on all these recommendations, along with guru interviews exclusive to Wall Street’s Best Dividend Stocks. • Plus, you get website access where all these recommendations are organized and stored digitally for you so that you can retrieve this stock information anytime you want it. • All without your having to leave your home! Remember, you would pay tens of thousands of dollars to subscribe to all the investment advisories that we search for our subscribers. But, as a new subscriber to Wall Street’s Best Dividend Stocks, you’ll pay just 40 cents a day for an annual subscription! Try Wall Street’s Best Dividend Stocks for 30 days. Get all the Daily Alerts delivered to your inbox. Read the digest issues, including all the income ideas and market analysis. Browse our members-only web site. Send me an email if you have questions or comments. If, within the first 30 days, you decide Wall Street’s Best Dividend Stocks is not for you, just call us and cancel. I’ll send you back a full refund for the entire cost of your subscription. No questions asked. This risk-free guarantee means you have nothing to lose. The best income investing ideas mean you have everything to gain. What are you waiting for? Subscribe now! So if you are thinking you might want to join us, now is the time to secure your spot. I just can’t make it any easier, more convenient, more affordable or more risk-free for you to try Wall Street’s Best Dividend Stocks and receive the top stock picks of Wall Street’s top income advisors without your risking a dime.